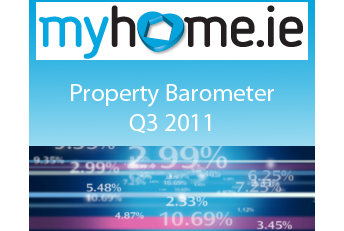 The latest quarterly property report from MyHome.ie shows that it remains a ‘buyer’s market’ as the downward trend in asking prices continue. Asking prices declining 3.2%% in Q3 2011. Asking prices nationally are down by 42% compared with the peak Q3 2006 while asking prices in Dublin are down 48% over the same period. The average mix-adjusted asking price for a property in Dublin now stands at €275k as against €241k nationally. Angela Keegan Managing Director of MyHome.ie said that while some issues remained outside our control it was vital the right calls were made on the Budget, on the proposed NAMA initiative and on addressing the issue of securing mortgage finance. These are issues within our control and if addressed properly will help us work through the overhang of unsold stock in the country and ensure we return to a normalised market as quickly as possible. The fact there has been a number of successful auctions recently is a positive, as is the lower percentage price fall for new homes. The average price of a new home is now €232K, down less than 1.5% over Q3. So affordability is improving all the time. The same applies to apartments where prices are down by an average of 4.4%’ Keegan said. how can one judge what a small property in an area should be when all the estate agents are vying for the sale of the few that are in the area? a three bed, SMALL bungalow in a nice bungalow estate in a border co.wicklow estate? its possibly never had new wiring and is in poor interior shape, i am at a loss to understand how i can figure if the asking price is too high or as commentators say ‘to be expected. does that mean, its the real price or over inflated in hope that you are an eggit? 1: Why can the Mortgage Lenders not increase the age limit to facilitate borrowers to meet payments, If a mortgage holder has Mortgage Protection Insurance why not have a mortgage up to 75 years of age at least. If age limitation was increased many mortgage repayments could be made at an affordable rate and homes in many instances may not have to be sold because a borrower could not make current repayment rates. 2: When a mortgage borrower goes onto Interest Only payments why must the capital for the remaining difference be charged back on the account which over a certain period makes the remaining mortgage unrealistic and revised repayment unmanageable in the future thereby reducing the equity in the property to an amount that if sold in the future leaves no value to purchase a much smaller less valuable homes.